Cara Thompson beat Royal Dornoch clubmate Alison Bartlett 2 and 1 in this afternoon's Northern Counties women's championship final at Inverness Golf Club. It is the eighth time Cara has won the title - one short of the record nine times set by Isobel McIntosh (Inverness) but the first time she has won the championship when Inverness has been the venue. Thompson was one up at the turn after losing the first to a birdie but winning the seventh and ninth. Bartlett three-putted the 11th and 12th to lose both holes and go three down. Thompson was bunkered to lost the 13th but maintained her two-hole lead to the end with a series of halves. 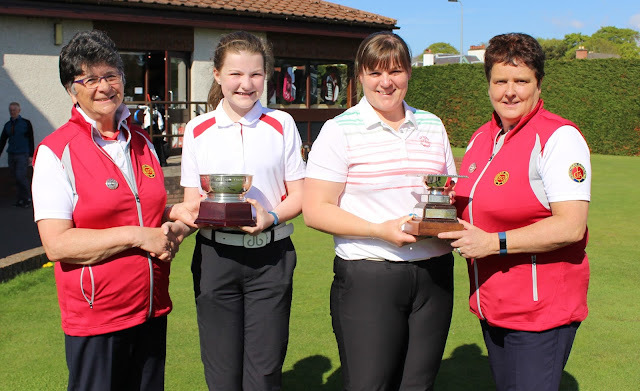 Iona Reid, 15-year-old Nairn Dunbar junior member, won the handicap title by beating Linda Wheeler (Forres) 6 and 4. Iona plays off 24 and Linda 15. Reid lost the first but won five holes in a row from the third and was three up at the turn. The Nairn Dunbar youngster clinched victory by winning the 11th, 13th and 14th. Cara Thompson (Royal Dornoch) bt Sandy Jackson (Royal Dornoch) 1 hole. Ellie Doherty (Moray) bt Steph Cloverly (Wick) 5 and 4. Thompson bt Boa 1 hole. Bartlett bt Doherty 2 and 1. Thompson bt Bartlett 2 and 1. Reid bt Wheeler 6 and 4.